Why do printer cartridges have chips? Many of you reading this blog will have a printer next to you as you read this and you will also have probably bought an ink cartridge at some point. But have you ever wondered why a lot of modern printer cartridges have chips? Well first of all let’s have a look into what types of cartridges have smart chips. There are two types of cartridges: Ink Tanks and Ink Cartridges. Ink tanks are those that just there to hold the ink, they don’t usually have any circuitry, they just plug into your printer and the ink gets fed to a print-head. Ink cartridges usually have a print-head built in and are sort of the ‘all-in-one’ of the printer world. 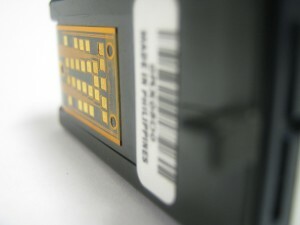 Primarily in this type of cartridge they are used so that the printer can communicate with the built in print-head and are necessary for the printer to work. As well as this they communicate other things to the printer such as ink levels. This is were a lot of people run into trouble, it can be very frustrating when your printer starts telling you that the ink levels are low but in fact you know that there’s still some juice left in there! This is due to the fact that the cartridge doesn’t actually know how much ink is in the cartridge, it just counts down how many pages you have printed. Another way the chip is used is to, in some cases, stop the cartridge being re-filled by third party companies. Some manufacturers just simply don’t like people re-using their cartridges as this usually means a loss for them, so once one of their cartridges runs out of ink, the cartridge will remember that it has no ink in even if it has been re-filled. So that little chip on the bottom of your cartridge does a lot really… both good and bad. If you wish to learn more about printers and ink have a look at the blog of the firm I work for, which can be found on our printer cartridge site. Kyle is the web developer for a site that sells printer cartridges in the UK. Good to know! My printer refuses ink refills and it drives me crazy. Very interesting post. To be honest, I never noticed if my Brother’s cartriges are simply ink-tanks or not…I think they are, since third-party refills are really inexpensive online. Sometimes, just knowing the floors of a product can make you avoid them, costly ink, not working, breaking down etc! Never thought about this cartridge. Learned new something today. Yeah, you’re right it is really frustrating knowing that you just bought your ink and then after a few prints it tells you that the ink level is low. When I encountered this one I really never thought of this. So, I just bought new one. Well, thanks for sharing this. Sometimes it can even be more cost effective to purchase a new printer, just to get ink cheaper! Thanks for stopping by and dropping us a comment! Hey, i was actually wondering what those chips are for. Do you know what could happen if we somehow intentionally damage the chip? In case i want to reload it but the chips keep sending the “out of ink” messages. How dependent is the printer on the cartridge chip? I wouldn’t try damaging the chip, it would probably just stop working all together. Is the cartridge actually empty? Well Antonia, I am not sure that the manufacturer would be very happy, but from an environmental point of view, if it means you can use ALL of your ink instead of chucking good ink away, surely (if it works) it can only be a good thing? Well done for commenting and becoming part of the community Antonia! I’m quite sure the manufacturer won’t like that, but the price of a new cartridge compared with a refill is enormous. And the quality is the same in the end. I say it again, I think that ink is extremely overpriced. I never knew about the uses of those chips, not until now. I’m pretty amazed of the logic behind the re-filling of cartridge. There are so many re-filling stations here so yes, that can absolutely causes their loss. Never really thought they also have security for this matter. You are correct , it really depresses that you bought a new ink and after some prints it shows ink level is not sufficient. Nice post, thank you for sharing. You have really imparted useful knowledge. Good to know, pat on the back for Kyle! There are disadvantages to using cartridges with chips, indeed. A lot of people may not be aware of this fact, though. If they do, I’m not sure that a lot of them will be thrilled of its purpose. It ultimately depends on the user (case by case basis). to the person who posted above DONT damage the chip at all! my epson has chips on it, and a few times i bought a brand new 4 pack that they put bad chips on, the chips were damaged and the printer couldnt read them and i had to throw them out. i spent 150$ one day buying new ink because the stupid chips were all bad and they wouldnt let me return them and i contacted epson and they pretended they didnt know that the whole chip thing is a scam to get us to buy more ink when we dont need it. i really really need help buying a new printer can you recomend a brand or something to me that doesnt completely stop working when a chip or program tells it to? i only print directions and codes for games, and i know i have tons of ink left but since it counted as a print im spending 500$ a year on ink and i rarely print! my printer gets jammed alot to and as i try to unjam it aech time its counting it as a print and all im doing is trying to get it to work! As regard to the printer, look for one with cheap ink! Before buying a printer go on ebay and search for refillable ink cartridges for the printer you want to buy. These refillable cartridges have chips that do not stop the ink cartridge from working once they run out of ink. So you just refill them and carry on printing. Actually the OEMs main excuse is that refilling might damage your printer (which happens rarely and both ways , new retail product or recycled). Also they ensure quality printing by purchasing new toner cartridges , which is so insignificant that they simply pull a cat by the tail. If you see that your printer gives you this kind of trouble after you refill it , simply reset your chip either replace it. You can find a lot of info on Google on how to reset your printer’s chip. Surely if you are careful then it is not an issue? It’s frustrating, for sure. It’s the same thing when you change your Operating System, unfortunately some printers don’t allow upgrading. Anyway, sometimes, shake the printed cartridge can be a solution :). I think this kind of restrictions can be explain under the concept of planned obsolescence. “It just counts down how many pages you have printed” It sounds like a misleading concept. Ultimately they want to make money, so they will try to get you to buy more ink, even if you don’t need it when your PC tells you you do. WHY DO INK CARTRIDGES COST SO MUCH. I suspect it is probably due to corporate greed, but ink itself could be expensive. I don’t know for a fact what the answer is. When I worked for HP, I worked at a site that manufactured and filled new cartridges. The ink pallets had containers measuring 4 feet by 4 feet by 3+ feet. That is at least 48 cubic feet of ink per pallet – roughly 360 gallons of ink. The site had many pallets of each ink color in the storage racks, as well as several in use on the automated filling lines. My guess is that the ink to fill a cartridge cost pennies – at the most. Most of the actual cost is in the cartridges themselves and the machinery. Hi Bill, thanks for the incite! I think you are probably right that it costs more to manufacture the cartridge than it does to buy/make the ink, however a large part of the cost to the consumer is probably just margins. The supplier and the retailer will both take a hefty sum I imagine! The root of the issue is the pricing model used by the printer manufacturers. Relatively cheap printers and extortionately priced consumables. There are high costs associated with protecting the OEM’s interests, i.e. all the copy protection that goes into the chip. I will take issue with the assertion that the OEM’s don’t like third parties refilling ‘their’ cartridges. Hang on a minute, these were sold to the consumer and what the consumer does with them when they are empty is not the concern of the OEM. Better still, just reduce the cost to a reasonable level and there will be no need for anti-counterfeit measures. A good point Alastair, but I think there must be enough people that only buy OEM ink for the manufacturers to continue to charge high prices for it, and recommend that consumers only use their ink. My printer claims to only work with genuine ink, but I use third party ink which lasts longer and works just as well.